Even the name Hanare now leaves a bad taste to my mouth. Hubby who is the Japanese food lover (between us) was so disappointed. It was my first time hearing him complaining about a meal non-stop, even after we left the restaurant. This is coming from a guy who is usually easy-going-shrug-it-off guy. After reading tons and tons of fantastic reviews about Hanare, I requested hubby to bring me here for dinner on Saturday. 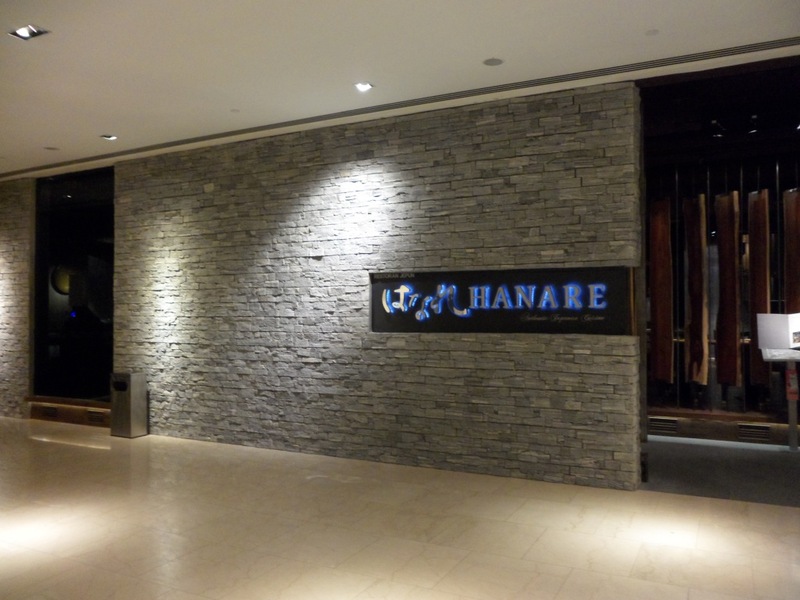 Hanare is inside the Intermark, where Double Tree by Hilton is in KL. When we reach there, there was only one other couple sitting in the restaurant. I should have guess then that something was wrong. How could a restaurant which is so raved about be so empty on a Saturday night?! Since everyone was raving about the freshness of the sashimi and about how fish are flown in 3 times a week from Japan, we decided to order the sashimi moriawase for 2-3 person. the menu specificed Tuna belly, Tuna, Yellow tail, White fish, salmon, scallops, sweet shrimps, salmon roe, uni (sea urchin). I love Uni !! On top of that I ordered the Dobin mushi (teapot soup) and their famous Goma soumen (cold black sesame noodles). Hub’s habit is usually to order their recommended food first to gauge before he order the second round. Usually, I always gripe about this as it will mean that we need to wait for our second round food to come. I much prefer to have my food on continuous flow. But, in this case, I was so glad we didn’t order anymore. If I have to sit there any longer, I might just start screaming. When the sashimi arrive, I was happily scanning around. Normally I don’t really check what fish or how many fish we were served. But this time, I notice right away that 1 item was missing and that was my favourite uni ! We asked the waitress and after some moment, we were presented with a small bowl of uni (2 pcs). What? So, they actually did left out the uni? And then, the ‘manager’ come over and inform us that normally it is only 9 items. And they have already given us 9 types of fish. And since we asked about the uni, they will also give us the uni. So now, they have given us 10 types. WHAT??!! What kind of reply was that?! I am not impressed at all. IF he were to come and tell me that uni is not fresh so can we replace it with another fish, I would have forgiven him. Already my heart sinks at the level of ‘class’ this restaurant has. Now that I look thru the menu again (which is online), they have also left out the sweet shrimps too ! sigh. Seriously, if they don’t have it, let the customer know and decide if we still want to order it or if we prefer something else. NOT to DECIDE for the client. I told the guy-manager that the salmon was not fresh and he gave me the fish is flown in story. YES !! I know that. That was why we come here to eat only your fish. But to have sashimi chef who can’t hold their knife?! It will only destroy your fish. Freshness of sashimi doesn’t only depends on where the fish comes from. It also depends heavily on how it was being handled. There’s really no point have having really expensive and fine ingredient if you plan to butchered it to death. It’s just a waste of fresh ingredient and also not respecting these fishermen who caught it. Not to mention, all the cost you spend flying them in. Why don’t you save those money and hire a better sashimi chef. You meant to tell me that just because your fish comes from Japan it is suppose to be FRESH? what utter rubbish. Then, he removed the WHOLE plate away from us ! and only return several minutes later with the a better sliced salmon… But, why-o-why do you have to BRING our whole plate away?! Normally, a high class restaurant would have return with the 2 fresh slices on another plate. By taking our other fresh fish away, the client wouldn’t get to eat the other slices and the fishes exposed to the room temperature for a longer period before consumption. At this point, I was already super pissed. Anyway, we decided to let bygone be bygone and I manage to clam myself down to try and enjoy our meal. After several slices, hubby start chewing with a weird look on his face and then he pulled out fish bone!!! o-my o-my. It is ultimately one of the most serious crimes of preparing sashimi. NEVER in our entire life (till now) have we had sashimi where there’s bone in it. And the worst? Hubby found 4 bones on different slices of fish. Yikes. BONES in Sashimi ! We got another manager over and show her the bone. She apologised but it was without grave tone. Somehow, it was like she’s used to this?! (Have this happen before?). By now, I have lost the mood to take pictures of anything. She did try to compensate us by bringing us 2 dessert. But, the damage is done. Overall, we had a horrible dinner there. Never had I left any meal in my life feeling so cheated. If this was a restaurant like the chain-franchisee type, I would have gladly shrugged it off. But, Hanare was supposed to be the epitome of fine Japanese dining inKuala Lumpur. Hanare is not allowed to have room for mistakes like this. Hanare is not allowed to have hit-and-miss. Hanare supposedly has been voted as one of Asia’s finest restaurants and is being included in The Miele Guide 2011/2012! What a joke. Whether or not they are high class restaurant or not, they certainly charge high class prices for low class food. My advice , STAY away from Hanare. It is not the type of restaurant where you pay for their hit and miss.